The Real Casa de la Moneda (Royal Spanish Mint) have launched two new coins which mark the FIFA World Cup tournament to take place in Brazil. Scheduled to be held from the 12th June to the 13th July next year, it is the second time that the largest country in South America has hosted the competition, the first being the 1950 FIFA World Cup. Brazil will become the fifth country to have hosted the FIFA World Cup twice, after Mexico, Italy, France and Germany. Brazil’s tournament will also be the first World Cup to be held in South America since the 1978 FIFA World Cup in Argentina, and the first time two consecutive World Cups staged outside Europe. In all, a total of 32 teams will compete in the world Cup with twelve venues or cities hosting the month-long tournament. The two coins, minted in gold and silver have face values of 100 and 10 euros respectively. The reverse of the gold coin features a representation of the 2010 World Championship insignia superimposed on a depiction of the terrestrial globe. The trophy represented was awarded by FIFA to the National Football Team of Spain, the current world champions. At left, inscribed in two lines of text, the value of the coin “100 EURO” and below this the mintmark. At right, the territorial outline of Brazil and within this the rhombus and the celestial globe symbolic of the Brazilian national flag. The text “COPA MUNDIAL DE LA FIFA” is inscribed along the upper half of the rim. The inscription “BRASIL-2014” appears along the base of the coin. 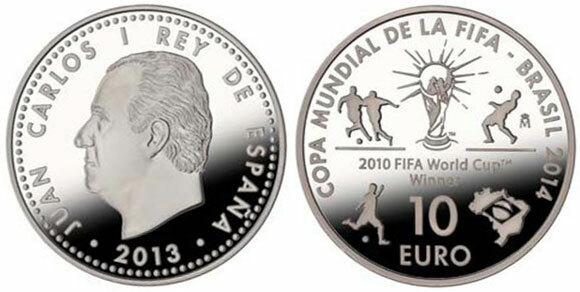 The silver coin’s reverse design includes the FIFA World Cup trophy. To the left, a representation of a football match with two players vying for the ball. At right, a single football player chest-traps the ball and further right, is the mintmark. To the lower left, another football player is aiming to kick the ball and at the lower right is an outline of the territory of Brazil with the Brazilian national flag positioned in the middle of the map. 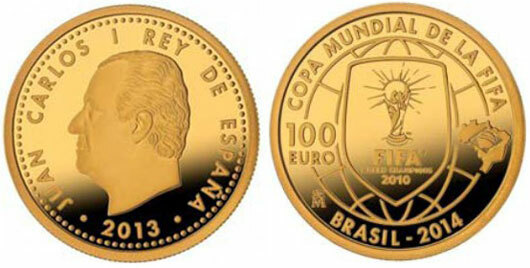 The text “COPA MUNDIAL DE LA FIFA – BRASIL 2014” is positioned along the upper half of the coin’s rim. The obverse design of both coins bears the effigy of His Majesty King Juan Carlos. The encircling text in uppercase letters reads “JUAN CARLOS I REY DE ESPAÑA” The mint year of “2013” flanked by two single beads on either side and appears below the King’s portrait. The primary design of the obverse is surrounded by a beaded edge. For more information in these and other coins offered by the Real Casa de la Moneda – Fabrica Nacional de Moneda y Timbre, please visit their website at: http://www.fnmt.es/index.php?cha=collector&scha=14&page=548&spage=550 Information is offered in Spanish and English, international orders fulfilled.